Our product range includes a wide range of kick bucket, three fold screen and basin stand single. As a noteworthy entity of this domain, we provide clients with the premium quality of Kick Bucket. Construction with high grade stainless steel, the kick bucket is construction and is known for stainless steel tubular frame work. Furthermore, the kick bucket is three 50 mm casters. The stainless steel bowl size of the kick bucket is 345 mm. In a zest to attain maximum client approval, we provide clients with the premium quality of Three Fold Screen. Dimension of the three fold screen is 675 mm height x 2450 mm length. Pretreated and power coated, the three fold screen is stainless tubular frame work along with curtain. 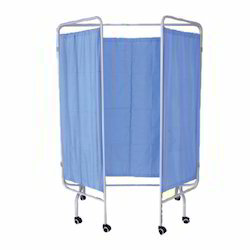 The three fold screen is used in hospitals and nursing homes. With the aid of years of experience of this domain, we provide clients with the premium quality of Basin Stand Single. Manufactured using latest technology, the basin stand single is known for its dimension of 810 mm length. 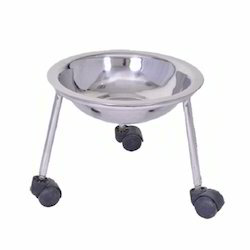 Known for its three 50 mm diameter casters, the bowl size of the basin stand single is 55 mm.